Bimal Pandey works on all levels for Amma and Swami. 24 hours a day he is fighting the negativity for the welfare of mankind. " I work nights in a 24 hours Wallmart store under the name of Asda. Swami sent me there. He said it is very bad, you must go there for me. Peoples lives are in danger as well and there are demonic forces at work there, will you go for me?" Swami and Amma send him to various places depending on how bad the negativity is there. "After working for Amma and Swami, the negative forces gashed my right arm. The first aid man put a blue plaster on my arm. 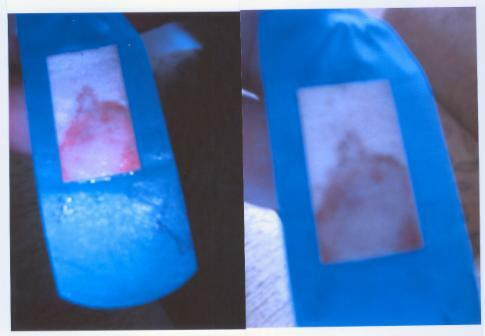 When I peeled it off there was an image of Amma in the blood on my plaster." "I put it back on and after 2 or 3 days it started coming off. Then I looked at it and there was an image of Krishna on it"
Here You can see that Amma ( Goddess Rajarajeshwari) Is talking to a tall divine being. This Divine Being is a Saint. 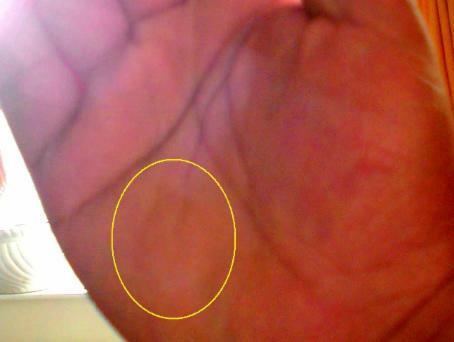 The Divine Saint's face has been circled with a blue ring and Amma's Divine Face has been circled using a red circle. You can clearly see the tall saint leaning over to listen to what the Divine Mother, Amma wants to say. 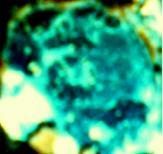 Above is a crystal that bimal had which contained ancient hieroglyphics within the actual crystal. Within the golden ring can be seen the face of a Divine Being. You can see that he has a short White beard and has short black hair. You can see the formation of his facial features also. In the above pictures Lord Ayyapa can be seen riding the Divine White horse. Lord Ayyapa's face and body has been circled using a Blue ring and the Divine Horses' face has been circled using a white ring. Lord Ayyappa is fighting with the being at the front of the picture. Bimal pandey fights wars for Amma and Swami on every level. This means that he is fighting for Truth in the different Lokhs, meaning the different realms, spiritual worlds and astral planes. However when he comes back down into his body, these wars project into the candles. In this picture you can see many Divine faces in which they have all been circled using a blue circle. In the bottom blue circle can be seen a Divine being with a beard. Here is another picture but this time a Divine being can be seen on the bottom left hand side lying down and looking up to the sky. This Divine being has black hair and a black beard. Here Lord Ayyapa has been circled in a golden ring and Lord Jagannath has been circled using a blue ring. This is a rose petal in which Lord Shiva's Divine face appeared in. Bimal Pandey does not do any poojas on the flowers, he only sprinkles a bit of water on them and the Gods and Goddesses appear. In this candle, the Divine Form of Lord Ayyanar has appeared. Lord Ayyanar is an incarnation of Lord Ayyappa. A clear distinct aspect of lord Ayyanar is his moustache. 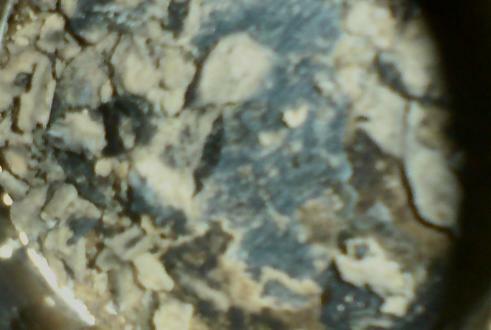 Here you can see that there are two clear faces. These faces are of Lord Ayyappa and Lord Shiva. 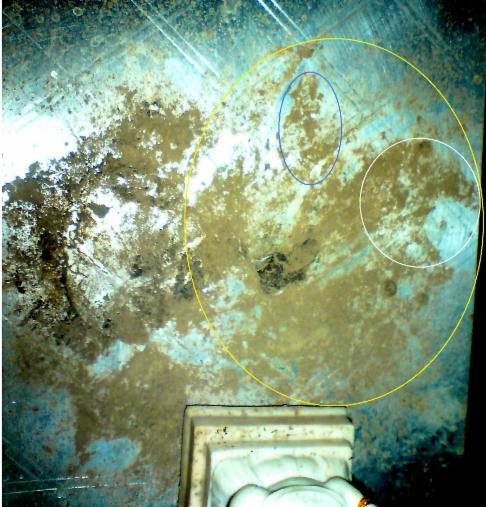 Lord Shiva's face has been circled using a golden ring and Lord Ayyappa's face has been circled using a blue ring. Here Lord Krishna in his baby form ( Bala Krishna) had appeared on the doorstep of where Bimal Pandey and Parmjeet Pandey reside. Lord Krishna can be seen in a crawling position. here Lord Ayyappa appeared holding an umbrella over the Mother Goddess, Aum Srimad Sai Rajarajeshwari. Lord Ayyappa has been outlined with a golden pen and Amma has been outlined using a red pen. 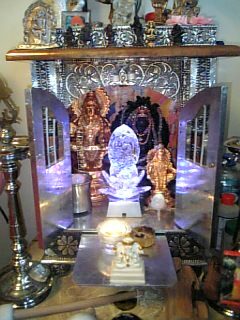 However just infront of Amma's Divine form is another Divine figure with black hair. This is again Amma but in a different form. The meaning of this leela is that behind the form of Goddess Rajarajeshwari is Jaganmatha. First its Amma's form on earth, then it is her true form, the true form of Goddess rajarajeshwari. 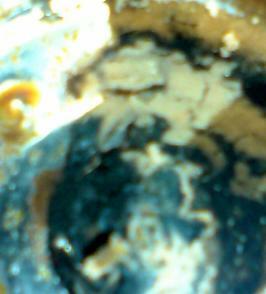 Here two Divine Beings have appeared in Bimal Pandey's coffee mug. Every Morning Bimal's wife, Parmjeet Pandey offers the aarthi to Lord ayyappa in their temple. This has portrayed itself in Bimal Pandey's mug. Parmjeet is on the left with her arm extended outwards and Lord ayyapa is on the right. On the forehead of Bimal Pandey, two divine beings formed in the vibuthi and Kum kum. 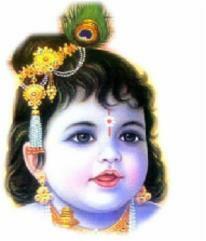 Lord Krishna can be seen holding Bimal Pandey. Bimal Pandey has been outlined using a golden pen. Bimal Pandey is holding on to the back of lord Krishna. Here Bhagavan Sri Sathya Sai Baba and Lord Shirdi Sai Baba appeared in the eye of Bimal Pandey. Swami has appeared on the right handside with a chubby face and Lord Shirdi Sai Baba has appeared on the left handside wearing a bandana. In this candle two Divine forms have been outlined. On the left holding a Bow is Lord sri Ayyapan and on the right is his son Lord Sathyaka. Here on the day of Bhajans which take place at the Divine Home of Bhagavathi Srimad Sai Rajarajeshwari in the U.K, where Bimal and Parmjeet Pandey reside, Amma's Divine face appeared inside the centre of the rose. Here three Divine forms have appeared in the candle. In the orange ring, Bhagavan Sri Sathya Sai baba's face can be seen looking towards the left. Then on the left handside in a golden circle is Lord Shirdi Sai Baba. then at the bottom in the blue circle is lord Sri Ayyappan.